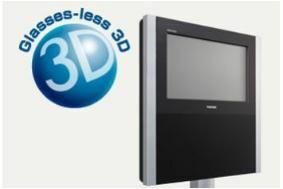 CES 2011: Toshiba going for larger glasses-free 3D TVs, and soon | What Hi-Fi? 40in+ models are set to appear in more markets, including Europe, over the next 12-15 months, and at CES 2011 the company is showing both 56in and 65in prototypes. It promises glasses-free large-screen TVs in Europe 'during 2011'. Both prototypes feature LED-backlit panels with 4096 x 2160 pixel (4k2k) resolution, with the company saying that 'The Toshiba Integral Imaging technology applied to its glasses-free 3DTVs works with multiple view points that enable the human brain to see 3D images, while also allowing for a wide viewing angle. Toshiba is all set to launch glasses-free 3D TV at the annual CEATEC show, which opens in Japan tomorrow. Two sets will be available in Japanese shops from December – a 12in model selling for around Y120,000 (£900), and a 20in at twice that price. The company will also be demonstrating a 56in glasses-free prototype at the show, although it says there's no timetable as yet for its release. There are no current plans for a wider release of the two Regza GL1 series models, Toshiba saying that the launch is 'technology-oriented' rather than being expected to create major sales. In other words, the company is putting down a marker by being first to market with commercial versions the technology, which uses nine parallax images and a vertical lenticular sheet over the screen. The TVs use a newly-developed LED-lit LCD panel, using four times the pixels of conventional TVs. In the 20GL1 that means approximately 829m pixels, and an array of 1440 backlight LEDs, to give a 3D image of 1280x720 pixel resolution. In the 12GL1 approximately 147m pixels are used, to give a 3D resolution of 466x350 pixels. The TVs are designed for viewing distances of 90cm and 65cm respectively, so not exactly living-room-ready yet! The new sets use the company's Cell Regza Engine to render the 3D image, and the Cell Broadband Engine for multimedia handling.